If you already have an experienced product manager on your team, they are probably/hopefully following some well-established product management process. But what about the early days of company formation before you have such expertise on staff? There are always more ideas (features/capabilities, new products, etc) than can be implemented in the desired timeframe. How do you prioritize the ideas to figure out which to focus on first? There’s a simple method I’ve used in the past that at least maps the ideas to various aspects of your business strategy. Let’s explore further. You get the idea. Try to simplify the ideas to their root benefit to the company. Those are your candidates for the categories. And if you can also decide which of the categories are most critical for your current planning horizon, then you have prioritization amongst the categories. It doesn’t mean you’ll choose to implement everything in the top category. In fact, probably not. But at least you’ve got a new dimension to help with the roadmap prioritization process. No all you need to do is start listing potential features and capabilities in the right category. 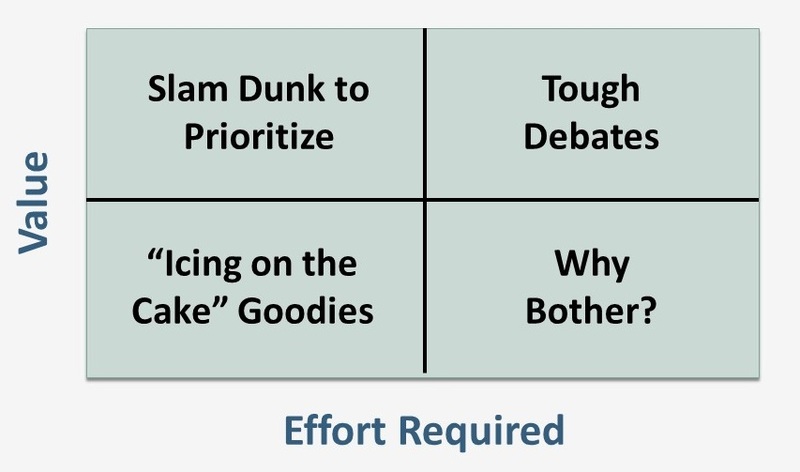 Top-Left Quadrant: These are a slam dunk to prioritize high because they give the biggest “bang for the buck”. Unfortunately, you’ll be lucky to have something land here. Top-Right Quadrant: These are the tough debates and where you will spend most of your time discussing. Bottom-Right Quadrant: Why bother with anything that lands here? Bottom-Left Quadrant: I call items that land here “icing on the cake”. Since items in the top-right quadrant present the toughest debates, consider creating a second X-Y grid just for those items. This second grid would introduce a second variable or perhaps use two completely different variables. It’s amazing how sometimes this additional perspective makes for a much easier debate. 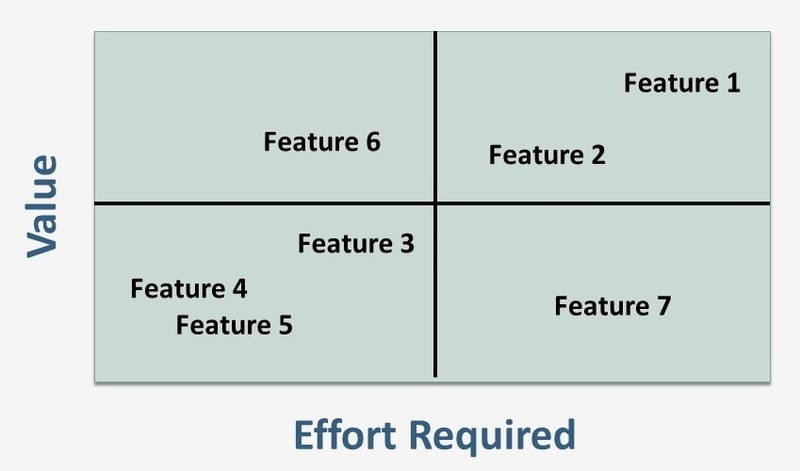 Regarding the “icing on the cake” goodies in the bottom-left quadrant, you’ll want to be careful not to include too many of these because each feature you add to a product release carries at least some risk to the project. For example, have you ever added a “simple” feature to your product and it ended up causing something else to not function properly? After prioritizing high value items, look here for any easy things that can be “thrown in”. The above concept has been included as a template in an online visual planning and strategy tool called Cnverg. Check it out. Regardless of which approach you decide from above, the next thing you need is a particular vocabulary to describe how critical each product, feature or capability is. I like to use the phrases “Must Have”, “Should Have” and “Nice to Have” because they are well understood. It usually works out that the Must Have features are the hardest ones to develop and/or take the longest. So it’s often the case that at least some of the Must Have features get deferred to a future release/version. What’s most important about this is the use of the common vocabulary amongst the team. Defending your recommendation that a feature be classified as Must Have is an important part of the prioritization process. Accompanying the priorities is usually a timeline. But in the early days when much of your planning is directional (versus specific), you might not need to be precise about the timeline for the phases of your roadmap. Instead, use what I call “planning horizons”. I’ve got an article on that exact topic titled “Strategy Horizons Versus a Timeline” if you want to give it a try. If you just scoped your first release (MVP or V1.0) and you only deliver the features you prioritized using the above exercises, will your product be functional? Whether you just scoped your first release or an enhancement release (ie – v2.0), will the new features make sense if released together? There might be some features that didn’t rank high on the priority scale but, if combined with a feature that did, make for a much more impactful marketing story and customer experience. After selecting your list of prioritized features and doing the above two sanity checks, determine how long it will take to deliver everything on the list. Assuming the answer is longer than you can afford to wait, decide if anything can be dropped from the list for this particular version. This is a common dilemma that every product manager and/or engineering leader goes through. Give these approaches a try. Find what works best for your company and your particular decision at hand. In fact, try doing the Priority Categories first and then create one or more Trade-Off Grids and use the two exercises to complement each other and provide additional conviction behind your decisions. Then consider visualizing the final results using something like the Strategy Horizons I describe in an article titled “Try Strategy Horizons Versus a Timeline“. Also realize that product roadmap prioritization isn’t a one-time exercise. On the contrary, it’s something you should revisit on at least a quarterly basis. And during your startup phase you probably need to revisit it monthly because of all the validation activities and fresh inputs that enter the picture. Remember that one unfair advantage you have against larger companies is your nimbleness and flexibility (see related article titled “ Unfair Advantage All Startups Have Against Big Companies“). Just be careful not to whipsaw the company by making dramatic changes every time without thinking a few steps ahead. That’s a topic for another article but in the meantime you might check out my article titled “3 Tools for Maintaining Focus“. Great post Gordon. Are there any tools you recommend for tracking this.? We currently use Asana as a collaborative environment where every team member can add an idea into a “new idea section.” The product manager then categorizes all new ideas into priorities. I really like your more detailed approach of specifying the business impact (“Improves customer retention” ect.) Will definitely have to incorporate into our operation! Tools like Asana are great for soliciting the ideas. As for the prioritization session, I usually find that in-person discussion and debate is required. So “old school” whiteboarding is best for dropping things into the categories and prioritizing amongst them. From there, project management tools can take over. An Austin startup named Khorus has an online Goals management system that could probably be used for this, even though its main purpose is tracking progress towards company-level goals.